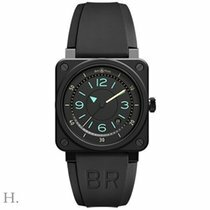 Bell & Ross Compass BR 01-92 limited edition. Automatic movement. 46mm case diameter. Black PVD coated case steel case. Water resistant to 100 meters. Black dial with minute counter centre disk and hour outer, arabic numerals in white. Lower half of dial in shaded glass. 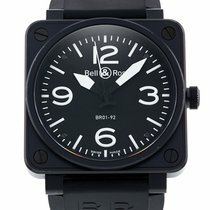 Black rubber strap with BR – embossed Tang buckle. Box and papers dated February 2011.